Since I decided to go down the east coast on this trip, the Blue Ridge Parkway has been something I’d planned on checking out. I don’t know a lot about it but it’s got enough hype to justify a quick tour. After camping in Shenandoah National Park – just north of the BRP – I decided to abort my plans and head due west for two reasons: first, it’s Labor Day weekend and there will be slow-moving tourists and scarce accommodations in well-known tourist zones, and second, I’m seriously allergic to something here in Appalachia. I was sneezing and full of snot in DC but it got several times worse as I moved west into the hills. 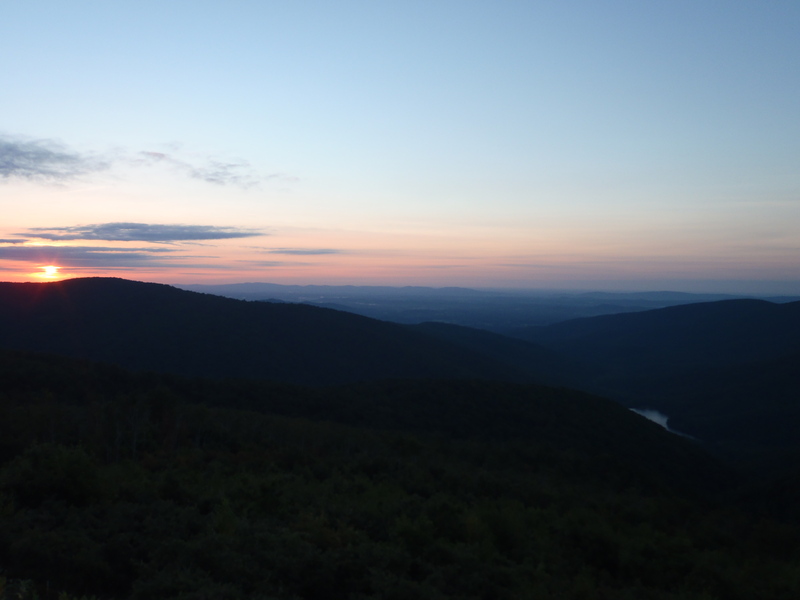 I packed up and was on my way out of Shenandoah by five thirty in the morning. 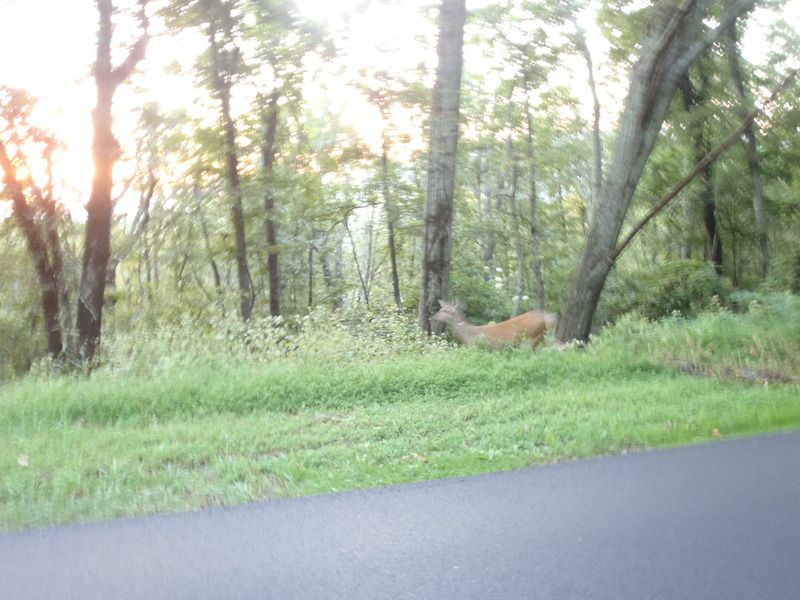 I quickly ran into a problem though – there are deer everywhere in Shenandoah before dawn. I couldn’t drive more than 15-20 mph in a 35 mph zone because they were all over the road. After coming to complete stops half a dozen times for deer (and once more for a flock of wild turkeys) I said to hell with it and pulled into a scenic view turn-off, going back to sleep for another half hour. Upon leaving the park I began taking random back roads in a generally westward direction, and I discovered a real gem – Route 250. I’ve never heard of this road but it’s a hell of a drive and really beautiful to boot. 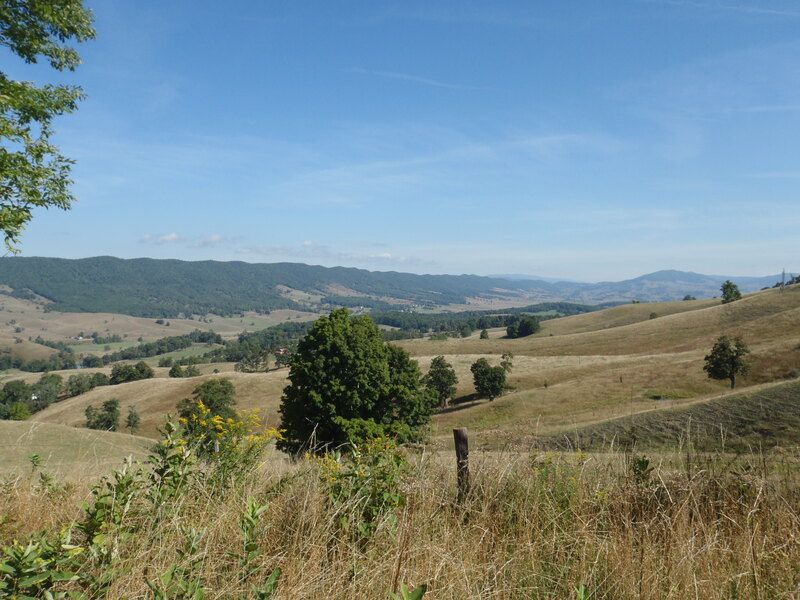 Unlike many other roads in the area that either take the path of least resistance or follow ridgelines, the 250 goes up and over all of the ridges via switchbacks, occasionally straightening up to go through a small valley town. It’s basically two straight hours of driving under canopied switchbacks, you’re either in a turn or getting ready for a turn. It was fun in the Wave, it would be epic on a motorcycle or a sports car. There was virtually no traffic, either. My plan at this point was to get to Kentucky and set up camp, but shortly after hitting the Kentucky border I hit some weird weather. Lightning, with a hot wind that seemed to be going in every direction, birds acting weird – asked myself, is this what the start of a tornado looks like? Apparently not, but it brought down some rain so I decided to defer finding a place to set up. Not sure whether it’s just because it’s Friday afternoon and Labor Day, but Kentucky drivers are being total assholes compared to West Virginia drivers. Although I thought I was going to need to stop shortly after getting into Kentucky, I get into the zone at this point and just start burning west. I didn’t make much mileage the first half of the day on account of 20 mph switchbacks, but I start making up for it now, driving becomes second nature and the biggest challenge is finding radio that isn’t Christian rock or country/western. One station seems to only play three advertisements – one for debt relief, one for alcohol and drug addiction help, and one for squaring up back taxes. Jesus Christ. I keep making distance until I cross a river (maybe the Ohio?) and cross into the southern tail of Indiana, and I decide I really should chill – it’s almost a fourteen-hour day of driving at this point. I find a state park and ask if there are any vacancies. The guy at the gate asks, “Do you mind the smell of horses?” I don’t like where this line of questioning is going but I respond that no, I do not. Turns out this park has a regular campground (no vacancies) and a second campground designed for people with horse trailers, in which there are empty spots. I take it. It’s hot and sticky, even in my drawers and with the tent wide open (minus the screen, which needs to be kept closed due to the ridiculous number of bugs), but I suppose it’s good practice for Central America. I fall asleep on a yoga mat covered in sweat. Whatever I was allergic to in the hills is here as well (or else I’m allergic to something else) but it’s a lot better. The terrain isn’t exactly postcard-worthy though, so I’m just going to burn west hard from here through Missouri and Kansas, and then get some altitude in Colorado.